Our ever popular Hamilton Chair is truly a design icon and is part of our Adirondack Collection. Combining timeless styling, comfort and functionality it is a chair that is incredibly versatile and your go-to chair for instant relaxation. Over the years this chair has been used by customers in rustic cabins, poolside, beaches, patios, decks and around fire pits and it looks equally at home in each of those surroundings. The chair has a gently curved back and is able to fold down for storage and transportation. The Hamilton also features a reclining option that allows you to adjust the angle of the chair back (not while seated in the chair) to your preference. The chair has been load-tested, per ASTM F1858-98 (2008) standard for Outdoor reclining plastic furniture, and has a 400 pound weight capacity Some assembly is required (see assembly guide). 10 months on the lake and good as new! I’ve had my table and chairs on the top of our dock for 10 months and they look as good as new! They are heavy, sturdy and durable and hold up great in the sun, wind, rain and snow! Great purchase! I've had 2 of these chairs for over 5 years. They are very sturdy and held up to the elements, including my dogs using the arms as a seat! I read a lot of great reviews, so I decided to buy just one at first. The chair reclines which was hard to find in an Adirondack. The color was rich - I ordered Federal Blue - and the woodgrain gives the impression of painted wood. I decided to order more and my husband -retired Air Force- suggested I order the red and white colors so I did. They look great together and we get a lot of compliments! I just received these by Fedex delivery and put them together over the weekend. Everything was wrapped and prepacked very nice. They went together with no problems and everything was top notch. I like that these chairs fold up and have 3 settings for comfort plus the 12-year warranty is a big plus. Also I am happy that your chairs are made in the USA!! Any company that bothers to wrap every different kind of screw seperately and puts the right bit into the package gets a 5 star review from me. Beautiful chairs, love the Nantucket blue, easy set up, easy to fold and unfold. I’m so showing these of to my friends when moving back to Europe!! 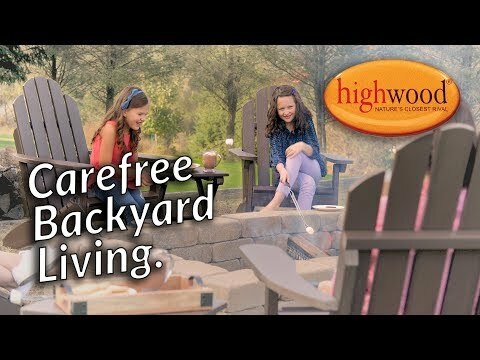 I've been looking everywhere for a new set of adirondack chairs and stumbled upon highwood in my search. My initial though was how pricey they were, but after reading I learned that these are maintenance free and you never have to stain them - plus a 12 yr warranty. I spent the money and I am so glad I did...completely worth the money! I did a lot of research on other sites before selecting these chairs. The reviews claimed that these chairs were comfortable, easy to assemble and required no upkeep. I couldn't agree more. Thanks for building a great product. We bought a set of 6 for around the firepit. They seem to be sized to fit most body types although we did have one guest (6'4") who probably would have preffered the larger king chair.